This stunning conservatory has become a symbolic image of the Missouri Botanical Garden. The geodesic domed structure was inspired by the futuristic design of R. Buckminster Fuller. Covering over a half-acre, the Climatron houses some 1,400 species of plants in a natural, tropical setting. Visitors enjoy viewing bananas, cacao and coffee trees, plus a collection of orchids and epiphytes. The rare double coconut, possessing the largest seed in the plant kingdom, is on display. A large collection of cycads, primitive gymnosperms with massive, divided leaves, are also on display. Several pools and waterfalls give a sense of lushness, as if visitors were within a true tropical rainforest. The Climatron is an ever-changing, impressive display all year long. 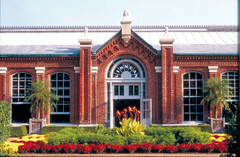 Built in 1882 to over winter palms, tree ferns and citrus trees, this brick conservatory is the oldest continuously operating display greenhouse in the United States. 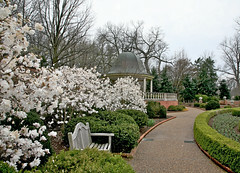 Camellias, fragrant olive and colorful companion plants have been featured here since the 1930s. The narrower southern half of the conservatory has been restored to its original use as an orangery. Various tropical and citrus plants are housed on the paved region from mid-October to April. They move outdoors annually in spring and summer to grace the Kresko Victorian Garden, Bakewell Ottoman Garden and other display gardens. Potted cactus and aroids from the Garden’s collections are also featured. Peak season of bloom is January through April. This dramatic greenhouse complements the Climatron, flanking the domed structure to the north. The spacious conservatory displays plants unique to the temperate regions of the world. Many of these regions are characterized by warm, dry summers and cool, moist winters. This conservatory features plants from the Cape region of South Africa; southern and southwestern Australia; the central coast of Chile; the Mediterranean Sea basin; coastal California; the temperate regions of Japan, China and Korea; and the southeastern U.S. The Temperate House has seven distinct interior gardens. Plants of the Bible can be found in one display, including figs, grapes, pomegranates, laurel and numerous herbs and spice plants. A special carnivorous plant bog features insect-eating flora. In addition, a historic stone portico overlooks a beautifully-tiled Moorish walled garden that reflects major elements in the history of formal garden design. Peak season of interest is late winter and early spring. This display features azaleas, rhododendron species and cultivars, magnolia hybrids and hardy shade-tolerant companion plants beneath a high canopy of native trees. An enchanting garden throughout the year, flowering peaks in late April and fall color peaks in late October. The elegant beauty of boxwood has been valued in gardens for thousands of years; from the "pleasure gardens" of ancient Persia, to the landscapes of Greece and Rome, to the formal gardens of Europe. Boxwood gives shape, structure and evergreen foliage to any garden setting. In the spring of 2009, a new entrance was completed. 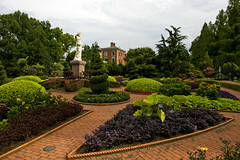 Visitors enter the Boxwood Garden through a handsome open brick courtyard that allows them to see inside the garden. This new opening features a fountain with vertical sprays of water than run continuously. 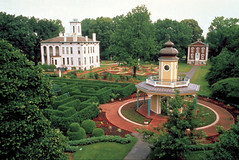 Visitors discover a formal oval boxwood parterre accented with colorful flowers and ground cover. From this spot, visitors enjoy a view of the beautifully designed Boxwood Garden and the surrounding grounds, including the English Woodland Garden and the Kemper Center demonstration gardens. From late February through early November, flowering bulbs and bulbous plants display their brilliance in rolling, brick-lined beds amongst companion shrubbery, flowering trees and annuals. During spring peak, tens of thousands of bulbs representing dozens of different perennial genera bloom in a world-class display. Throughout the summer, many species of tropical bulbs are added, carrying the flowering display through late fall. The summer peak features a wide selection of lilies, cannas, aroids and tropical amaryllids. 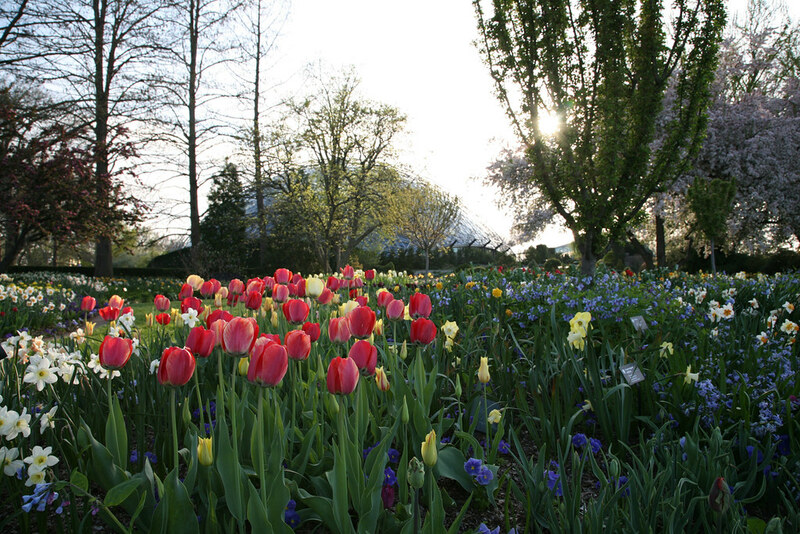 Nationally-recognized collections of Narcissus and Lilium are featured in these two gardens, as well as many rare and endangered bulbs from around the world. This inspirational garden honors the life and accomplishments of the extraordinary scientist and native Missourian who greatly influenced 19th and 20th century agriculture and education. Designed for peaceful contemplation and learning, the garden features a small amphitheater surrounding a life-size bronze statue of Dr. Carver, surrounded by a reflecting pool. Plantings of viburnums, hydrangeas and hollies provide a secluded, intimate feeling. 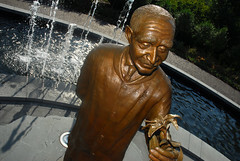 The Carver Garden is intended to serve not only as a memorial but also a learning laboratory for educators and students. The Children's Garden is all about family fun, play and learning. Children and adults explore themes of adventure and discovery on the 19th century frontier as they learn about the importance of plants in daily life. It opened spring 2006 on nearly two acres west of the Climatron. Of historical note are the large Osage orange trees, believed to date back to Henry Shaw's time. He planted these trees to line the road to his house, which stretched from Tower Grove House to Old Manchester Road, known today as Vandeventer. Also found in this area are several large trees including pin oak, sycamore and tulip poplar. Smaller trees include crabapples, bird cherries and chestnuts. Perennial and seasonal bedding plants accent a brick paved courtyard. Ongoing interest. A display of plants discovered and described by botanist George Englemann, including unusual cacti, succulents, and herbaceous plants. IN PROGRESS. A soft rose and blue-grey limestone terrace surrounding two fountains is framed by seasonal displays of bedding plants. IN PROGRESS. Swift Vista was carefully designed to enhance the views down the Vista and take advantage of the beautiful architecture of the Linnean House. 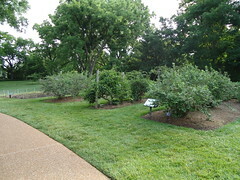 Its features include a formal hornbeam hedge (Carpinus betulus) along the south side of the Vista; seasonal bedding around the pools which display tropical water lilies; and the Swift perennial border which showcases wild-sourced, herbaceous Eurasian species, focusing on some of the world’s most biologically diverse hotspots with climates that are similar to St. Louis including Romania, Central Asia, Altai, and Caucasus plants. Displays in this border will be carefully phased in and will include biennials and perennials grown from seed, resourced through various collecting expeditions and reciprocal trade with foreign institutions. These visually stunning borders represent the Garden’s ongoing efforts toward creating horticulture displays that showcase the Garden's research and conservation efforts and provide visitors the opportunity to experience greater plant diversity. All this under the watchful eyes of the statues of three of the world’s most renowned botanists, if you look carefully I am sure you can see each of them smiling. IN PROGRESS. Adjacent to Shaw's original stone wall, this nationally recognized Daylily Garden provides a link between the Goodman Iris Garden and the Victorian district of the Missouri Botanical Garden. 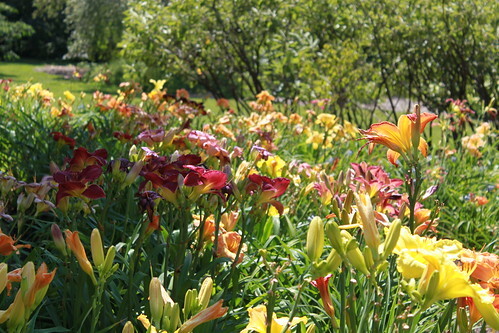 Over 1,800 daylily varieties representing many different award collections, wild species, historic varieties and Missouri-hybridized cultivars bloom throughout June and July, with many reblooming through late fall. Surrounding the daylily plantings is another notable collection of witch hazels (Hamamelis). This collection of over 60 varieties blooms in winter, spanning the entire length of the Daylily Garden on both sides of the path. This informal, meandering dry stream bed is constructed of cobble stones edged throughout with large limestone rock boulders. Flanking the dry stream are plantings of native, rare and endangered, and other ornamental plants typical of this habitat. 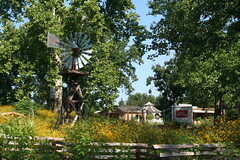 A small pond at the north end is planted with hardy Missouri native aquatic plants. These two delightful gardens are located immediately in front of the Shoenberg Temperate House, crossing the path into the Heckman Bulb Garden. 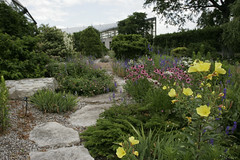 The Heckman Rock Garden features a myriad of flowering bulbs, perennials and shrubs from rocky and alkaline environs. Many plants native to Missouri glades as well as endangered species from the Republic of Georgia are grown, complimented by various dwarf conifer selections. The Kassabaum Dwarf Conifer Garden features many fine selections of hardy, dwarf-growing conifers for the Midwest. Located near the Lehmann Rose Garden is a collection of American hollies. Several cultivars are represented, included red and yellowish-orange fruited varieties. Also found in this area of the garden are bottle-brush buckeye, tulip poplar, London plane tree, ginkgo, ash, linden, oak, beech, maple, hackberry and serviceberry, as well as spruce, hemlock and pine. Hostas with green, blue, yellow and multi-colored foliage thrive below stately trees. 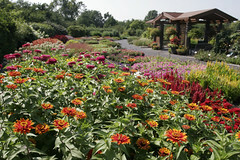 Ten wild species and over 100 cultivars are featured among companion plants with interesting leaf textures and flowers. 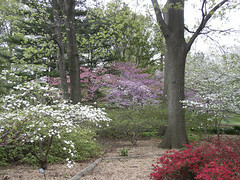 Flowering bulbs, magnolias and witch hazel accent the area in spring; astilbes and lilies in summer; and dogwoods in fall. Peak season of bloom is summer. The charming Four Seasons sculpture by Marie Carr Taylor featured among the hostas has become a Garden favorite since its installation in 1991. The curious-looking metallic monument in the same area is actually an antique British lead cistern dating to the era of Charles II (1660–1685). Hundreds of cultivars of bearded iris are in peak bloom around Mother's Day, representing nearly every color of the rainbow. 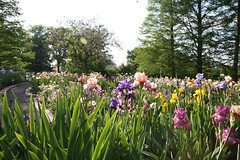 Tall, intermediate, border and dwarf bearded irises, as well as Japanese, Spuria, Louisiana, Siberian and many rare species comprise this nationally-recognized collection. Many of the collection's bearded irises rebloom, repeating the flowering season from late August through late November. This picturesque landscape provides a scenic vista between the Milles Sculpture Garden and Henry Shaw's Mausoleum Garden. The Knolls feature slightly undulating topography and artfully-placed clumps of trees and shrubs. Since 1914, this has been a wonderful spot for visitors seeking a solitary, simple setting. Peak seasons of interest are spring, summer and autumn. 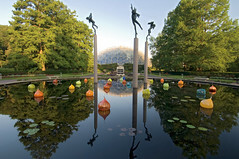 This sculpture garden consists of three large reflecting pools which span the Missouri Botanical Garden's central axis from the Spink Pavilion to the Climatron. The pools, built in 1913, have been fully renovated and display seven works by the late Swedish sculptor Carl Milles. Bald cypress trees frame the majestic vista, further accented by seasonal borders including pansies, tulips and summer annual displays. The tropical water lilies and giant Victoria water lilies peak in August and September, and have been a major Garden attraction since before the famed 1904 St. Louis World's Fair. From spring through fall, colorful glass Walla Wallas by artist Dale Chihuly bob in between the water lilies of the central pool. Shaped like a giant wheel, this garden displays hundreds of hybrid roses. Many climbing rose varieties are featured on the formal fence and arbors that enclose it. Peak display lasts from early summer through autumn. 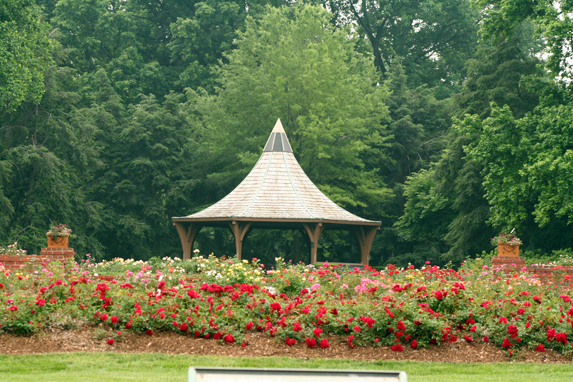 This large rose garden contains historic cultivars, miniature roses, modern hybrid tea, floribunda and shrub roses, and test roses. A gazebo with a fountain and small pool can be found near the south end of the garden. Toward the center, the bubbling Kerchival Fountain entertains visitors. The dramatic Shapleigh Fountain at the north end of the garden is a favorite among children. Peak season of bloom is early summer and autumn. Designed to delight the senses, this beautiful garden offers an engaging sensory experience for both the young and young-at-heart. Smell the heavenly scented flowers and spicy herbs, hear the trickle of the Shell Fountain and the ring of the Solari Bell Tree and touch the texturally tantalizing annuals, perennials and herbs. Peak months are May through October. Showcased primarily in raised beds and container plantings, the plants in this garden are used for educational and therapeutic programming under the Missouri Botanical Garden’s Therapeutic Horticulture Program. 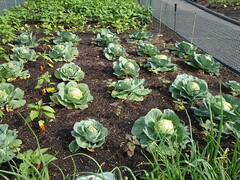 Individuals of all abilities can enjoy what this garden has to offer. 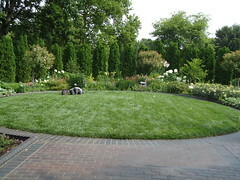 Created in 2010, the Pfautch Bavarian Garden complements its nearby garden neighbor, the Strassenfest German Garden, by highlighting plants native to Germany and central Europe along with those developed by German plants people. The Bavarian Garden features over 180 tons of stone arranged as a rock outcropping with mostly sun-loving alpine and alpine-like plants. Swiss stone pines are the predominant trees, providing an evergreen screen and backdrop to the display. 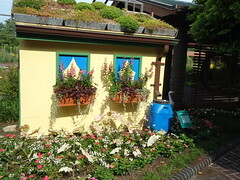 The garden is nestled against a former greenhouse, which has been transformed into a Bavarian farm house façade with brightly-colored window boxes and flower-painted walls. It is often said that a Chinese garden is built, not planted. 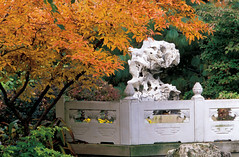 Architectural elements such as walls, pavilions, bridges, sculptural stones and pavings are of central importance, while plantings of plants native to northern China or integral to Chinese gardens are used sparingly. Designed in the traditional colors of black, white, gray and vermillion, the intricate artistry and exquisite detail of the Nanjing Friendship Garden pavilion, the focal point of the garden, creates a subtle elegance in the landscape. Tiles designed and fired in China were used to create the roof of the pavilion, decorate the window frames and lattices and top the wall. Artisans from Nanjing constructed the major features including the mosaics in the bluestone path. This garden, designed by Chinese born architect Yong Pan, is a showplace of absolutely extraordinary craftsmanship. The Chinese Garden is beautiful any time of the year. This quiet, informal garden attracts people and wildlife alike. Three vegetation layers, typical of mature woodland, support an upper tree canopy, a middle shrub layer and a lower layer of herbaceous perennial plants and ground covers. Several small clearings permit shafts of sunlight to spear through the dark overhead canopy. In the spring, hundreds of woodland flowers including dogwoods, trillium, Virginia bluebells, winter aconite and azaleas put on a massive display. This garden was renovated in 1994, almost doubling the size, adding several water features and making it accessible to wheelchair users. Peak season of interest is from early spring through summer and into autumn. This garden is named Seiwa-en, which means "the garden of pure, clear harmony and peace." Designed with great care by the late Professor Koichi Kawana to ensure authenticity, this 14-acre garden is one of the largest of its type in the Western hemisphere. A four-acre lake is complemented with waterfalls and streams. Dry gravel gardens are raked into beautiful, rippling patterns. Four islands rise from the lake to form symbolic images. Several Japanese bridges link shorelines; families delight in feeding the giant koi (Japanese carp). 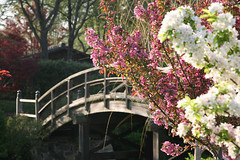 Visitors are enthralled by Japanese maples, cherry blossoms, azaleas, chrysanthemums, peonies and lotus. This garden represents centuries of tradition and a multiplicity of cultural influences synthesized in a uniquely Japanese art form. 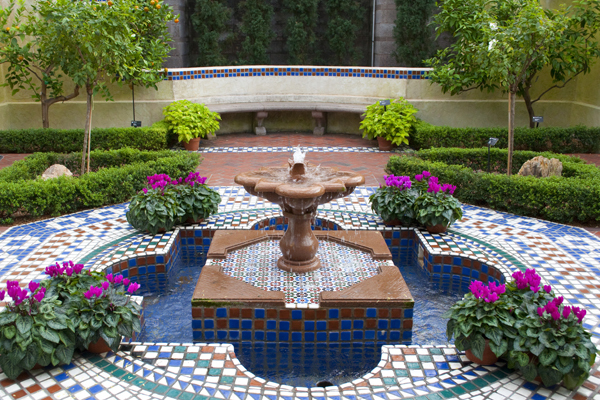 This Ottoman-style walled garden is the first of its kind at a botanical garden in the U.S. 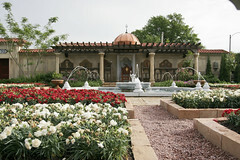 The Ottoman Garden is devoted to the enjoyment of the senses. Fragrant flowers and aromatic herbs surround the center focal point, a shallow pool of water called a havuz. Various fountains created in Turkey provide a strong sense of authenticity. The German Garden incorporates some of the native flora of Germany and central Europe, as well as plants hybridized or discovered by native Germans. The design is that of a woodland setting and plantings are meant to have a natural, informal appearance, with no particular design or pattern. The artistic centerpiece for the garden is a bronze bust of Dr. George Engelmann, a German physician who immigrated to St. Louis in the 1830s. He was a noted botanist and a principal advisor to Garden founder Henry Shaw. The sculpture is surrounded by some of the new species of plants described by Engelmann or named for him, including conifers, cacti and grapes. Directly behind Shaw's summer home, Tower Grove House, one discovers this intimate garden. Inspired and tended by the St. Louis Herb Society, this quaint courtyard includes beds of culinary and medicinal herbs. This garden is a step into the past, as if taking a trip back to the Victorian Age. A wrought-iron fence encloses the area, which is sheltered by majestic, towering oaks and sassafras trees. The ground is blanketed by Baltic ivy and liriope. In spring, small blossoms of snowdrops and scilla peek through the ivy and liriope. It is here that Garden founder Henry Shaw rests. This entertaining and puzzling maze recreates one constructed by Shaw in the 1800s. Visitors wind through a labyrinth of yew hedges. Yews alternate with paths leading to a vine-clad gazebo. The Victorian Garden is a majestic example of the height of fashion in England at the time Shaw was planting his gardens in St. Louis. The style of landscaping was introduced in the early 1800s when new varieties of flowers were coming into England from different parts of the world. Elaborate and colorful combinations of flowers, foliage and succulents were combined in "plant tapestries," the combination referred to as "carpet bedding." Spring, summer and fall displays of lush and vibrant floral orchestrations light up this area in Victorian style and grace.